So last month I put up a record 10 posts and this month is slipping by with none so far!! Needless to say, we have been really busy. We drove up the family to Toronto for a business/personal trip and stopped by at Niagara Falls on the way back. At 5 1/2, Adam was totally underwhelmed by the falls. All talk about one of the 7 natural wonders (which apparently, it isn't one!!) didn't help. After about 10 minutes, he said, "Can we look at something else now?" I guess if the first big waterfall you see when you're 5 is Niagara Falls, pretty much all waterfalls after that will be a let down! 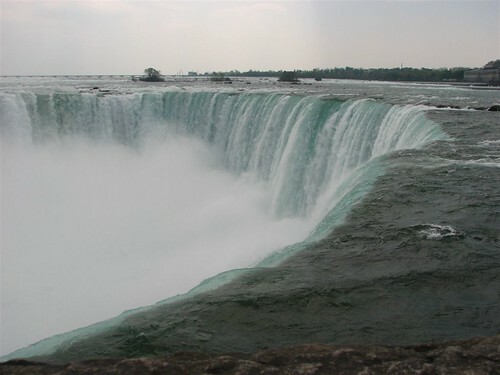 I remember seeing Niagara Falls as a child around the same age. I recall being sort of impressed but didn't understand what the big deal was. We did the walk under the falls and I remember having to put on a mildewy raincoat that they provided and also some boots that were too small. Seeing the massive amounts of water falling before my eyes was not as memorable as the uncomfortable boots that were too small!! So I guess the apple doesn't fall far from the tree. This time, I was far more impressed, especially since we got to see it from the "better" Canadian side, and was able to stand right up against the edge of the falls, just 10 feet away. (I'm not sure what that phantom image is over the falls, but we were truly right on the edge, one false move and we'd be whisked away!). "Niagara Falls! 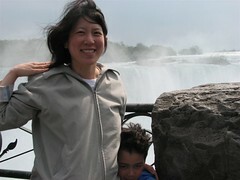 Slowly I turn, step by step, inch by inch..."
My family went to the falls a few years ago and stayed a few days. We saw both sides of the falls (American and Canadian) and have to admit that the Canadians have the better side. 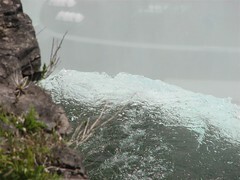 I wasn't all that young (probably about 41) and so I knew I was seeing some awsome power in those falls. Yes, especially when standing beside them on that small kind of walkway. Anyways....it might not be one of the 7 wonders of the world...but it was fun. Actually.....even better than the falls was an animal park that we visited that was not too far from the falls. I think this "might" be the place. Animals like the monkeys are very interested in you in the car, and in all the shiny parts of the vehicle...and the often climb on cars and try and rip off wipers or other chrome bits...it was a riot. While there, we saw a tour bus rammed by a rhino..and it made a darn big dent and scared a lot of people on the bus!